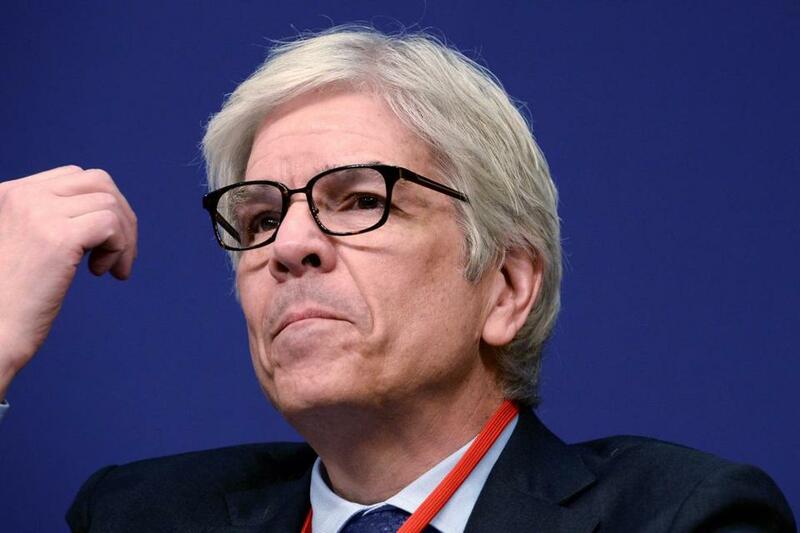 Paul Romer (above), who shared the 2018 Nobel Prize for economics with Yale University professor William Nordhaus, is an alumnus of Phillips Exeter Academy in Exeter, N.H., and did graduate work at MIT. STOCKHOLM — Two American researchers have been awarded the Nobel Prize for economics for studying the interplay of climate change and technological innovation with economics. William Nordhaus of Yale University and Paul Romer of New York University were announced winners of the $1.01 million prize on Monday by the Royal Swedish Academy of Sciences. Nordhaus received his doctorate from the Massachusetts Institute of Technology in 1967, according to his official biography. He also received undergraduate and graduate degrees at Yale, where he is a professor. Romer did graduate work at MIT and attended Phillips Exeter Academy in Exeter, N.H.
Romer said he ignored two early morning telephone calls, thinking they were spam calls, before the academy was able to reach him. “I didn’t answer either because I thought it was a spam call,” he said. The academy said Romer’s work ‘‘explains how ideas are different to other goods and require specific conditions to thrive in a market.’’ Previous macroeconomic research had emphasized technological innovation as a driver of growth but had not modelled how market conditions and economic decisions affected creation of new technologies, the academy said. The prize comes just a day after an international panel of scientists issued a report detailing how Earth’s weather, health and ecosystems would be in better shape if the world’s leaders could somehow limit future human-caused warming to just 0.9 degrees Fahrenheit (a half degree Celsius) from now, instead of the globally agreed-upon goal of 1.8 degrees F (1 degree C). Nordhaus has argued that climate change should be considered a ‘‘global public good,’’ like public health and international trade, and regulated accordingly, but not through a command-and-control approach. Instead, by agreeing on a global price for burning carbon that reflects its whole cost, this primary cause of rising temperatures could be traded and taxed, putting market forces to work on the problem. UN Secretary-General Antonio Guterres bluntly told leaders in New York that unless current emission trends for greenhouse gases are reversed by 2020, it will be impossible to keep global warming below 1.5 degrees Celsius (2.7 degrees Fahrenheit), which was a key goal of the 2015 Paris climate accords. The UN chief challenged governments to end fossil fuel subsidies, help shift toward renewable energy and back a price for carbon emissions that reflects their actual cost. He cited, for example, that climate-related disasters already cost the world $320 billion last year, a figure likely to grow with increased warming.